Fritz Henderson started off on the wrong foot with the post-bankruptcy board of General Motors Co. -- and failed to win its confidence, according to a book by Steven Rattner, chief of the Obama auto task force. The following are selections about the downfall of CEO Henderson from Rattner's Overhaul: An Insider's Account of the Obama Administration's Emergency Rescue of the Auto Industry. On Aug. 3, 2009, after General Motors Co. emerged from bankruptcy, incoming and holdover board members met the Obama auto task force before the first official board meeting. The group was briefed by Harry Wilson, a task force staffer working on GM. Harry began the third section [of the briefing] by laying out our scathing opinion of GM's culture in bullet points that pretty much spoke for themselves. "Insularity," which Harry called "The GM Way," came first. Then "lack of accountability," followed by "[lack of a] sense of urgency," "need for more change agents," and a "culture of losing." "If you really think about GM and where they are coming from," Harry said as he pointed to a line about consistent market-share losses for thirty-three years, "they've mostly lost. Most of these managers have never won." He also knocked the company for bad supplier relations, for GMAC's misadventures in subprime mortgages and for the lack of "green" cars on the road. The room was quiet. Some old board members were shifting in their seats. [Former interim Chairman] Kent Kresa and a few others nodded when Harry lambasted GM's bureaucracy and inability to make fast decisions. [Chairman Ed] Whitacre, rarely one to speak much, occasionally murmured, "That's right." Harry also harped on the need for change agents at GM, people from inside or outside who would shake the place up. "I get it. The top management is not good," interrupted Patricia Russo, the ex-CEO of Alcatel-Lucent, who was new to the board. "But do you see that spark somewhere?" Harry paused for a long time and volunteered a name: "Bob Lutz." "I don't think he's that good," objected Steve Girsky, the former Morgan Stanley analyst who now occupied the UAW seat on the board. "We like that he actually knows product," said Harry. "But we need more like him that are younger." 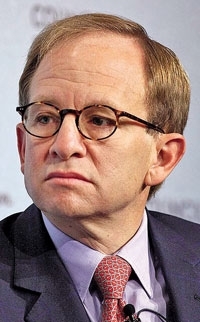 Rattner: "Somewhat dismayed that Fritz's idea of change was to let the seventy-seven-year-old Lutz 'un­retire'"
I would have agreed with Girsky. Lutz's swashbuckling personality stood out at fusty GM but I'd never been overwhelmed by the substance of what he had to say. And I'd been somewhat dismayed that Fritz's idea of change was to let the seventy-seven-year-old Lutz "un­retire." But in truth none of us on Team Auto was a management expert. As the meeting ended and the board rose to leave, Whitacre quietly asked [task force member] Sadiq [Malik] for a copy of the presentation. In the coming weeks, many directors would tell me that they both appreciated the candor of the briefing and were dismayed by much of what they heard. None took issue with the core message. Fritz had sent Whitacre an agenda for the [first] board meeting. It would be a milestone of sorts as the first board meeting under Ed Whitacre and the first of the new GM. At the top of the agenda Fritz had put "Chairman's Review," figuring that Ed would welcome the opportunity to note the occasion and say a few words about his expectations and the state of the company. Then the board would turn its attention to the issues at hand. But as the meeting began, Whitacre had no remarks. He just looked at Fritz and asked, "You want to make some introductory comments?" The CEO froze, saying nothing for several seconds. Finally he said, "Welcome to the new GM." Then he simply got the meeting started, telling the board, "We have a lot of things to cover," and turning over the floor to -- of all people -- [CFO] Ray Young. As discussion unfolded, Fritz was kicking himself. He'd let slip an opportunity to lay out his vision and strategy for GM. He could always provide that vision in later meetings and speeches, but never again would there be a chance to set the course of the company at the start of the first meeting of the new GM board of directors. Fritz's misgivings were confirmed after the meeting adjourned. [Director E. Neville] Isdell pulled him aside and said, "You missed your moment." A little later, Whitacre sat down with him privately to discuss the board's initial determinations. He told Fritz the board would give him 120 to 150 days, then assess his performance as CEO. Fritz pointed out that that wasn't a lot of time. And what exactly, he asked, would he be graded on? "How will you measure change?" Fritz asked. Henderson: After Whitacre told him how the GM board would grade him, Fritz thought, "I'm cooked." In reality, opposition to Henderson was mounting, especially among the new directors, who had always been skeptics. Change -- or lack of it -- had become a major sticking point. Many directors felt that GM's presentations remained too optimistic, just as the task force had warned. And even though [previous CEO Rick] Wagoner was gone, board members saw some of the old arrogance, including a resurgence of the view that GM's bankruptcy was not its fault but rather was due to the financial collapse and economic downturn. Some members of the old board, including [director Philip] Laskawy and Kresa, were inclined to give Fritz more time. 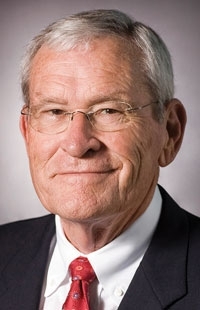 Compared to Wagoner, he was a believer in change. During his brief tenure as interim chairman, Kresa had coached Fritz about the need to bring in new blood. Fritz had duly read up on other companies and cultures. But recruiting outsiders for top posts wasn't his strength; he remained doggedly loyal to GM people and ways. By the time of the discussion in the executive session after the November board meeting, it was clear to all that Fritz would be asked to leave in a month's time. The problem was whom to replace him with. For reasons much like our decision to replace Rick with Fritz, no one believed that GM could be left rudderless while a search was conducted. Nor, of course, were there any potential successors within the executive team. So the board looked in its own midst for at least an interim solution. Girsky wanted the job, but while he was well liked and highly respected, no one thought he was ready to be CEO of General Motors. [Director Daniel] Akerson, a former CEO, declined to be considered, citing his obligations to Carlyle [Group] and lack of enthusiasm for living in Detroit. Directors began to wonder whether Whitacre could be pressed into service. Fritz could sense rumblings, but he was in the dark. On November 30, the day before the December board meeting, he decided to end the suspense. His calendar called for him to leave right after the meeting to be the keynote speaker at the Los Angeles auto show; he asked Whitacre whether he ought to keep to his travel plan. The chairman told him to hang back. Although the board had not yet made a formal decision, Whitacre knew with virtual certainty what would occur the next day. When Henderson asked whether he could have done anything differently, Whitacre, his successor, said, "No." The next morning, the board plowed through its regular agenda. Afterward, in an executive session that lasted less than five minutes, the directors voted unanimously to relieve Fritz. Then the board turned to Whitacre, securing his assent to become interim CEO while a search for a permanent replacement was conducted. When Whitacre delivered the news to him a few minutes later, Fritz had two reactions. He told Whitacre he didn't want to stay on if the board didn't want him. And he asked, "Could I have done anything differently?" For some reason, Whitacre answered "No." A little later, Whitacre pulled Girsky aside. "You with me on this?" he asked. He offered the former auto analyst a full-time job as a top adviser, with the title of vice chairman. Girsky was elated, but since his responsibility on the board was to represent the UAW, he said that Whitacre should call [UAW President Ron] Gettelfinger to get his approval. Whitacre reached the UAW leader, who asked, "When are you doing this?" "In about thirty minutes," Whitacre replied. "Nothing gets done at GM in thirty minutes," Gettelfinger said, laughing. But he readily agreed. 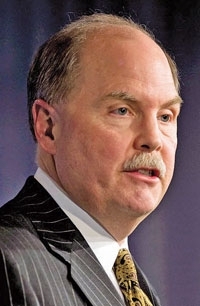 It couldn't hurt to have the UAW board designee doubling as consigliere to GM's CEO. Before the public announcement, Whitacre assembled many of Fritz's direct reports in a thirty-eighth-floor conference room -- executives such as Ray Young, [global manufacturing chief] Tim Lee and GM's new head of human resources, Mary Barra. "Fritz Henderson has decided to step aside and the board has accepted that decision," he told them. "I will step in as interim CEO." There were few happy or relieved faces; mostly the executives responded with a mix of anger and sorrow. "I was handpicked by Fritz, so if you had a problem with him, then you probably have a problem with me," Lee said, and offered to step down on the spot. "Hey, hey, I am not taking anyone's resignation tonight," said Whitacre. "Fritz is the least surprised person right now. This is the way it has to be. We all have to stand together." The last thing he wanted was a mass exodus, which would look really bad in the media. A little later, in a hastily arranged press conference, the company released the news to the world. Fritz Henderson, the first CEO of the new General Motors, was gone. 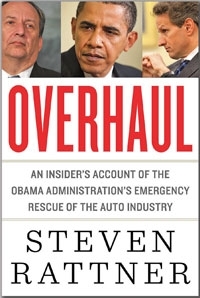 Excerpted from OVERHAUL: An Insider's Account of the Obama Administration's Emergency Rescue of the Auto Industry by Steven Rattner. Copyright &Copy; 2010 by Steven Rattner. Used by permission of Houghton Mifflin Harcourt Publishing Company. All rights reserved.